This is going to be one of the most unusual posts I will ever produce. Why? Because it is going to include (comparatively) little text, and is going to consist predominantly of pictures. Today we went to Marwell Zoological Park (Hampshire, England), and I'm pretty excited about the new animals we saw. More on those in a minute. In the world of global wildlife conservation, Marwell is an important place, having played key roles in captive breeding and/or reintroduction schemes for Takhi Equus przewalskii (the equid formerly known as Przewalski's horse), Amur tiger Panthera tigris altaica (the felid formerly known as the Siberian tiger) and Scimitar-horned oryx Oryx dammah. They've also bred Okapis Okapia johnstoni, White rhinos Ceratotherium simum, and many other species. Visit the Marwell Conservation site if you're interested. Like most people interested in animals, I don't really like animals being kept in captivity, but my philosophy on zoos is that they're an integral part of wildlife conservation. For a good recent review of why zoos are so important see Bertram (2004). 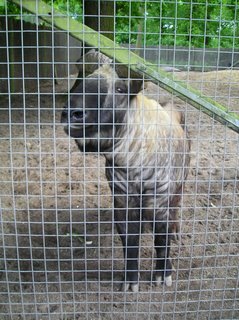 Until recently we were members of Marwell Zoological Society, but financial constraints have resulted in a lapse of our membership. Anyway, it rained a lot today, and it even hailed at one point. But this isn't such a bad thing if you want to watch captive animals, as it actually means that they do things you don't normally see. Two of the Amur tigers were incredibly playful, for example, chasing around and tussling like kittens, and it isn't very often that you see that. 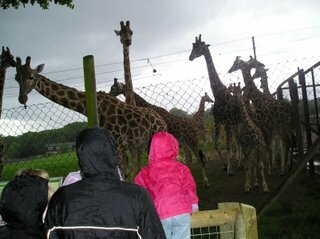 The giraffes obviously wanted to get out of the rain, and (as you can see from this photo), all 13 individuals stood patiently next to the enclosure gate, waiting to be let into their house. I've never been able to get this many giraffes in the same photo before. What about those new animals I mentioned? I'll start with the most amazing [images at top left and below]. 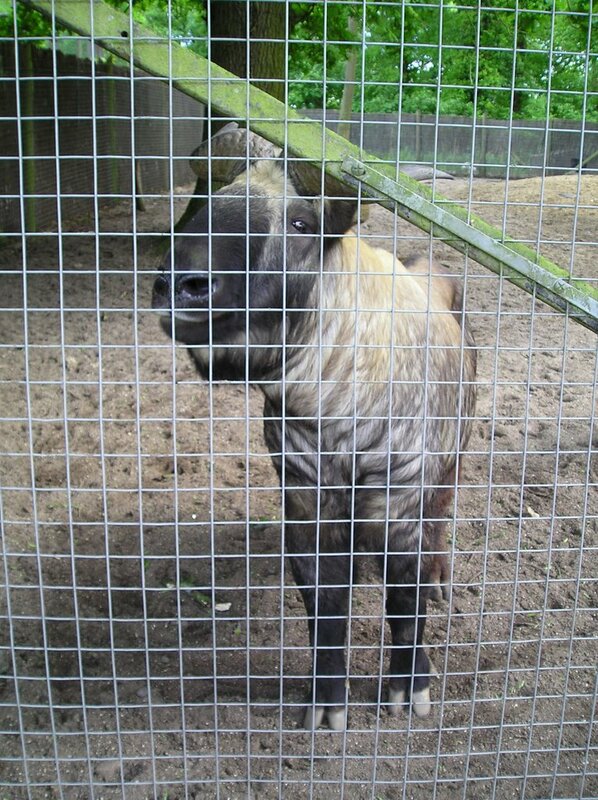 Yes, it's a Takin Budorcas taxicolor, a bizarre goat-antelope from the bamboo forests of the Himalayas. I've never seen one before, and I never even expected to see one. They had two individuals (male and female: the male is shown at top, the female below). They're odd. 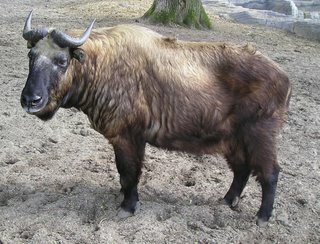 They look somewhat like other goat-antelopes, like tahr and serow, but they have a really slow, deliberate and muscular-looking gait, plus proportionally massive, blunt dew claws. These apparently help them grip to rocks when they're climbing. The proximal parts of their limbs were way more stocky that is usual for an artiodactyl, giving them an almost bear-like shape. Also new to me were Vicuna Vicugna vicugna, a small Andean camelid with rodent-like incisors. They somewhat resemble Guanaco Lama guanicoe but are smaller and lack callosities on the medial sides of the forelimbs (if I remember correctly). Their fur looks shorter and less woolly, and their gait and the way they hold their neck while walking is distinctive too. 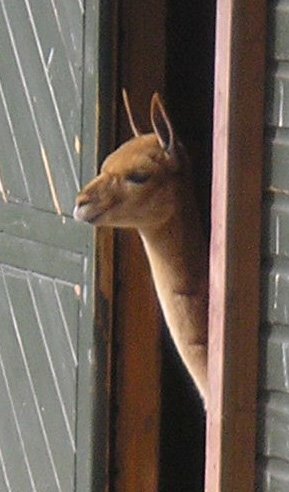 This now means that I've seen all extant camelid species (all in captivity, of course), though note that the species-level taxonomy of South American camelids is a little muddled (Kadwell et al. 2001). The only photo I got shows one of the animals peeking out from its house (at left). 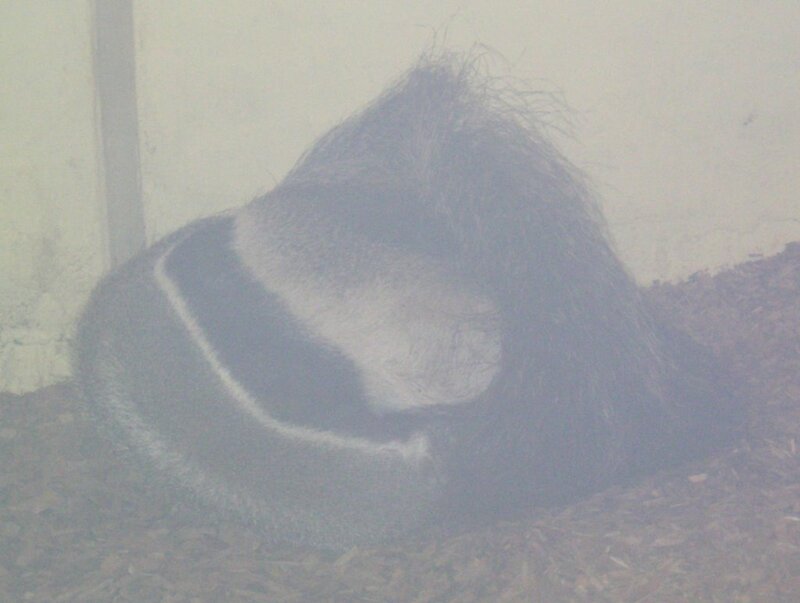 Finally, I was amazed and delighted to discover a captive individual of one of my favourite mammals, the Giant anteater Myrmecophaga tridactyla. Everything about anteaters is fascinating: their ecology, behaviour, anatomy, functional morphology and evolution. 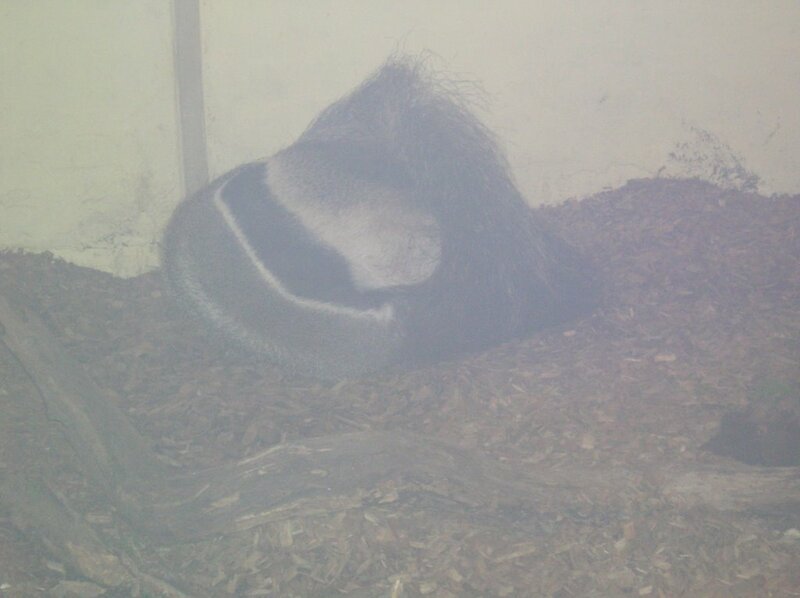 Unfortunately the animal was asleep, and, as you can see, the only photos I have are rubbish as the flash bounced off the glass. It slept in the posture described in the books: curled up, with the tail wrapped over the limbs and snout. Cool. Other neat animals I saw were Fossa Cryptoprocta ferox, but I've spent hours watching these during various visits and definitely don't count them as new. We got some good photos of the male individual, including of it scent-marking a tree stump. Then there were the porcupines, hyraxes, marabou storks, okapis, snow leopards, dwarf crocodiles, peccaries, pygmy hippos and rheas. Thoughts on many of these species will follow one day, perhaps. Right now I need to go do some cooking. Bertram, B. 2004. Misconceptions about zoos. Biologist 51, 199-206. Kadwell, M., Fernandez, M., Stanley, H. F., Baldi, R., Wheeler, J. C., Rosadio, R. & Bruford, M. W. 2001. Genetic analysis reveals the wild ancestors of the llama and the alpaca. Proceedings of the Royal Society of London B 268, 2575-2584. Thanks for the photos and the write-up. The giraffes provided a good lesson on how adaptable those animals are. The next time you go to the zoo do what you can to take along an extra digital camera, plus extra batteries and memories for the same. Then max out the memory. You can, after all, download it all to the computer later and reuse the memory on your next photographic expedition.